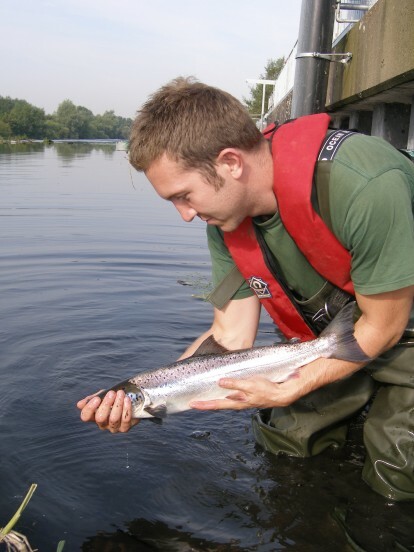 Whenever anyone buys a rod licence to fish for salmon and sea trout they are legally obliged to let us know if they have caught fish and how many times they went fishing. This is really important data because it helps us understand how many fish are caught, taken or returned back to the river and how much time anglers put into catching those fish. It's a great indication of how well stocks are doing and if we need to take any action should catches take a turn for the worst. A new online service allows salmon and sea trout anglers to submit their annual catch returns and time spent fishing. Previously, anglers sent in their catch returns on a paper form attached to their licence, but we have had feedback asking why it can’t be done online. So, with this in mind, we have recently launched a brand new online service that allows salmon and sea trout anglers to submit their annual catch returns and time spent fishing at www.gov.uk/catch-return. The free online service can be used on a range of devices including your home computer, tablet or mobile phone. All you need is your licence number and postcode and you can start entering your data. The new service also has added features over the old paper form too, such as the fact that you can record your fishing results throughout the year rather than having to remember it all at the end of the season. Just log-on each time you have been fishing to enter your data and then, when you've finished your fishing season, you can easily submit it. Don’t worry if you can’t log in or not sure what to do, our support staff will be happy to help you. We hope anglers are going to find this a quick and simple way of providing crucial data from the comfort of your home - no more walking to the post box in the rain. You can also get a print out at the end, so you can keep a record of what you have caught each year. The paper form is still available if you prefer but we hope you'll give the online form a go and let us know what you think (there’s a survey when you submit your data). We want as many anglers as possible to use this new service. Normally, we receive more than 22,000 envelopes with catch return forms in so it would be nice to receive as many as possible electronically this year. This new development to record catch returns online at www.gov.uk/catch-return was funded by rod licence money. But this is only one area where money raised from rod licence sales is reinvested – other projects include improving facilities for anglers, fish restocking, invasive species eradication, and working with partners to encourage people to take-up fishing for the first time. Sarah Chare is Head of Fisheries at the Environment Agency. You can follow @SarahChareEA on Twitter. There's hardly a salmon in the rivers to fill in the form going to be a real eye opener this yr when u get the forms back stop the netting and all the food that's been taking out for the farmed fish mans greed once a gain there's salmon of a 1lb coming into the rivers wake up and do your jobs and protect what's left catch and release on the rivers and no more netting. The ea are a disgrace. Is his site a joke? I tried to enter my details and that I hadn't fished to date but might do later, so I pressed the give return later button and it just went back to the put in your rod licence number and postcode page! Frustrating! Best send me a paper request? Hello Paul, We are sorry that you have experienced difficulties when using the online catch return system. Please call us on 03708 506506 with your address details so we can send a form to you in the post. How am I supposed to enter a NIL return on crappy web site. fairly obvious who designed it ! !